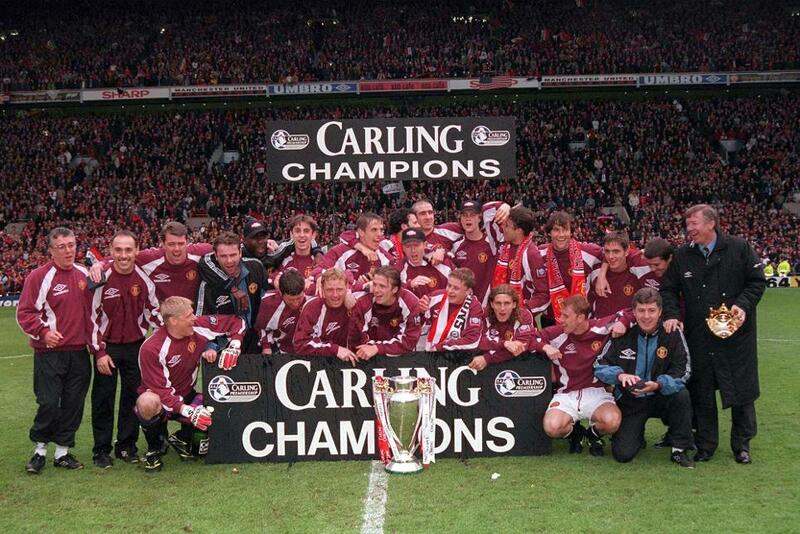 After the euphoria of England's run to the UEFA Euro 1996 semi-finals on home soil and a gripping title race between Manchester United and Newcastle United the previous Premier League campaign, the two sides were the main protagonists again in 1996/97, with Sir Alex Ferguson's side winning their fourth PL crown in just five seasons. Newcastle, who had let a 12-point lead slip to Man Utd in 1995/96, made a statement of their intent clear with the world record signing of England striker Alan Shearer, who arrived at his hometown club from Blackburn Rovers for £15m in July. But it was another English star, who had not featured in Euro 1996, that made his mark on the opening day of the season. Manchester United academy starlet David Beckham scored from inside his own half as the Red Devils beat Wimbledon 3-0 at Selhurst Park. Fabrizio Ravanelli, who joined Middlesbrough after scoring in Juventus' UEFA Champions League final victory over Ajax the previous season, scored a hat-trick in Boro's 3-3 draw with Liverpool on his debut in August. Other notable recruits included his former Juve team-mate Gianluca Vialli at Chelsea, for whom Ruud Gullit was made player-manager after an impressive debut season, while Patrick Vieira arrived at Arsenal and Patrik Berger joined Liverpool, who saw legendary striker Ian Rush depart for Leeds United. After two defeats from their opening three matches Newcastle won six on the bounce before they welcomed Man Utd to St James' Park in October. The Premier League leaders thrashed the defending champions 5-0, with Philippe Albert's sublime chip rounding off a memorable victory. A shock 6-3 loss to Southampton and a 2-1 home defeat to Chelsea followed for Man Utd. But United soon embarked on a 16-match unbeaten run, starting with a 1-0 win against Arsenal, who had appointed Arsene Wenger as manager from Japanese side Nagoya Grampus Eight the previous month. It was the first defeat of Wenger's long and successful reign at the north London club, and it allowed Man Utd to wrestle the momentum back in the 1996/97 title race. United's form was inspired by Eric Cantona, who scored a sublime chip in a 5-0 win against Sunderland. 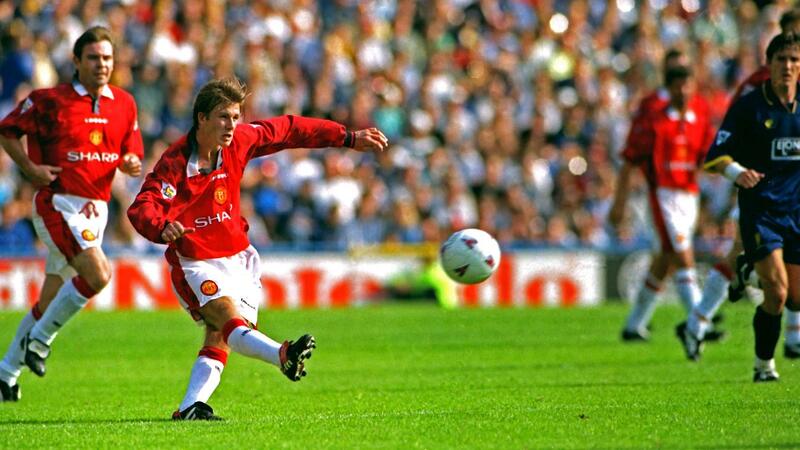 That was one of 11 strikes in 1996/97 for the Frenchman, who netted over 10 goals for the fourth successive Premier League campaign before announcing his shock retirement in May at the age of 30. He would finish his Old Trafford career by playing a key role as Man Utd surpassed Liverpool, who led the table at Christmas after just three defeats in the first half of the campaign. A New Year's Day reverse at Chelsea and a goalless home draw with West Ham United enabled Man Utd overtake Roy Evans' side in January. A seven-match winless run resulted in Newcastle slipping to sixth and, despite a 7-1 win over Tottenham Hotspur in the following match, Kevin Keegan announced his shock departure, with former Blackburn Rovers manager Kenny Dalglish replacing him at St James' Park. Newcastle's form picked up as a result and they moved back into the title reckoning but in March a thrilling 4-3 loss at Liverpool for the second season running, in a match in which they rallied from 3-0 down only to be sunk by Robbie Fowler's late winner, dealt a crucial blow to their hopes of a maiden Premier League crown. A defeat at promoted Sunderland and a 3-2 loss to Derby County, who benefited from a dazzling first goal from Costa Rican striker Paulo Wanchope, were the only occasions Man Utd were beaten in the second half of the campaign. The title was sealed with two matches to spare as Newcastle drew away at West Ham, Arsenal went on a three-match winless run and Liverpool fell to a 2-1 reverse at Wimbledon, despite a consolation goal from 17-year-old debutant Michael Owen, who would go on to establish himself as one of the most prolific strikers in England the following season. While the title race was decided, with Man Utd finishing seven points above Newcastle, Arsenal and Liverpool, attentions turned to the relegation battle on the final day. Nottingham Forest were already consigned to the drop, while Southampton went from being five points adrift of safety to being all but assured of survival after four wins and three draws in seven matches. That left Middlesbrough, who reached the League Cup and FA Cup finals only to lose both, and Coventry City looking to overtake 17th placed Sunderland and secure safety in the season finale. Boro had been deducted three points for failing to fulfil a fixture earlier in the campaign and a 1-1 draw at Leeds United confirmed their relegation, despite the best efforts of Ravanelli, who netted 16 league goals, and Juninho, who won the Player of the Season award. Sunderland's 1-0 loss at Wimbledon allowed Coventry City to preserve their Premier League status by just one point, after Dion Dublin and Paul Williams struck in a 2-1 victory at Tottenham Hotspur for Gordon Strachan's team.